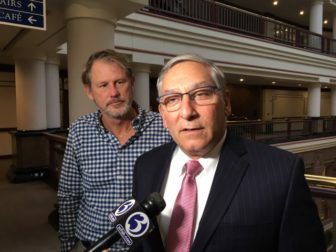 Senate Republican leader Len Fasano said he fired his chief counsel, Michael Cronin, on Monday after the lawyer admitted misappropriating “tens of thousands of dollars” from a Senate GOP caucus PAC that Cronin oversaw as treasurer in 2018. At Fasano’s urging, Cronin reported the theft to Chief State’s Attorney Kevin Kane, whose office has opened a criminal investigation into the finances of a PAC that reported raising more than $130,000 this year. Cronin, a legislative lawyer for nearly 20 years and a trusted legislative aide, was the treasurer of the Senate Republican Leadership Committee, one of three Senate GOP caucus PACs, each with its own treasurer. Last week, Fasano said, he confronted Cronin about a bounced check and complaints from one or more vendors of unpaid bills. The misappropriation did not impact the campaigns of Republicans, who lost five seats last month, Fasano said. After an 18-18 tie for two years, Democrats will have a 23-13 majority when the 2019 session opens on Jan. 9. Fasano said the Republicans will pay the bills, and Cronin has promised restitution. Len Fasano and his deputy, Kevin Witkos, meeting with reporters Monday. The Senate Republicans announced Cronin’s firing at midday, issuing a statement in which Fasano said, that Cronin”informed me that as sole signatory of the Senate Republican Leadership PAC, he removed without authorization tens of thousands of dollars from the caucus PAC, monies that were donated to support state Senate candidates. Fasano told reporters later that he confronted Cronin after one or more campaign vendors told Jason Stark, who coordinated the Senate GOP campaign efforts, they had not been paid. Fasano said Cronin assured him the bills were being paid, but failed to provide the bank statement he sought. 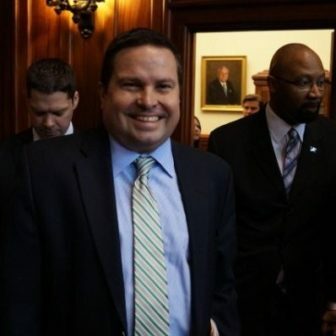 The Senate leader insisted on a face-t0-face meeting early Monday at his law office in New Haven, where he says Cronin admitted the thefts. Fasano said he told Cronin he should self-report the wrongdoing to the Office of the Chief State’s Attorney. Fasano then followed up to ensure the call had been made. Cronin has been a lawyer with Republicans at the General Assembly for nearly 20 years and was paid $149,000 last year. He was promoted on Aug. 7 and his annual salary raised to $175,000. He was the treasurer of the Senate Republican Leadership Committee, a political action committee that reported raising $130,167 and spending $113,265 as of Oct. 28 in support of Republican candidates for the state Senate. State law allows each caucus three leadership PACs.